Nothing sells like nostalgia. And no one knows this better than Fujifilm in the tech space. Over the years the Japanese camera company has cashed in on the same with its Instax range of instant film cameras. While the earlier models like Mini 8 sold for under Rs 5,000 on Amazon, the company is now thinking premium with the Square SQ10. Starting next month, the Square SQ10 will start selling in India for a price of Rs 22,999 — a 10-pack of Instax Square film costs Rs 699. With smartphones changing the way we experience photography, it seems natural for Fujifilm, a veteran in the camera business, to adapt to the market needs. Its Square SQ10 is a hybrid digital instant film camera, and also the most expensive one in the Instax series. This new camera will let you save and edit photographs right on the LCD screen before printing, a feature that differentiates it from others in the Instax series. The SQ10 is also the first in the series to use the film Square Film format, obviously in a 1:1 aspect ratio of 86×72mm, thus giving it the name Square. The camera has a 1/4-inch CMOS sensor with a 28.5mm f/2.4 fixed lens. The internal memory can store around 50 photos, and the storage can be upgraded via a microSD card slot. The SQ10 promises to take better photos in low-light conditions when compared to other cameras in the Instax series. It can also take close-up shots from four inches away. The camera also comes with 10 different filters, along with vignette control, brightness adjustment, live view, and built-in photo editing. The company says the Instax Square SQ10 is primarily targeted at those millennials with high disposable income. So while many assume Fujifilm’s instant film cameras will be popular in urban centers, the company says the demand from rural areas continues to grow due to increase in disposable income. 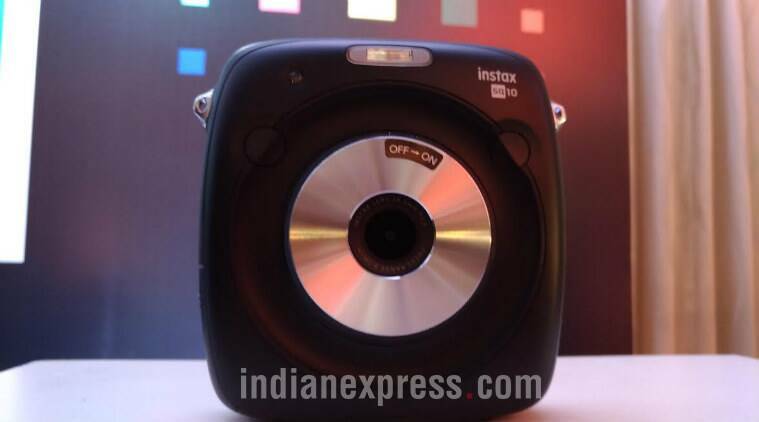 “We’re roughly selling around 4000 to 5000 Instax cameras a month in India,” Yasunobu Nishiyama, Managing Director, Fujifilm India, told Indianexpress.com. “We want to double our sales from what we did last year,” he adds. For Fujifilm, sales of Instax cameras have been encouraging, with a total of 6.6 million units sold globally in 2016, a 30 per cent increase from the previous year. As the camera ha achieved cult status in some countries, Fujifilm expects sales could touch up to 7.5 million this year. Other than the Instax Square SQ10, Fujifilm also launched four new mirrorless cameras – the XT20, X100F, XA10 and XA3 in India. All these cameras are aimed at professional and amateur photographers. The company will be selling these cameras in India starting next month.